This time last year, I discovered a wonderful resource that had only just been published and I’m not quite sure why it has taken me until now to share it with you! 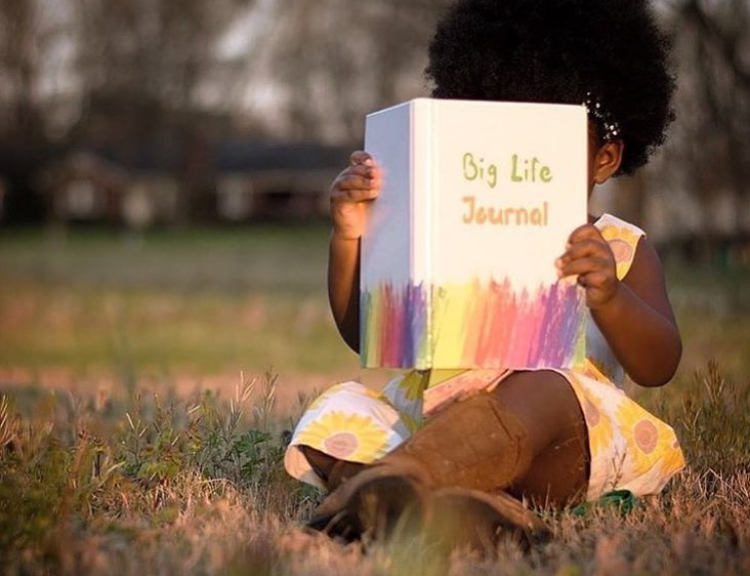 It’s called Big Life Journal and is an illustrated journal designed for children aged around 7-11 to complete with a parent. I tried it out on my daughter over the course of the Summer holidays last year – she was 7 at the time. As a result throughout this past academic year, she has definitely shown evidence of ‘growth’ rather than ‘fixed’ mindset tendencies. This concept is also slowly being adopted in schools but how in practice do you teach ‘growth mindset’ to primary school aged children? The Big Life Journal is the perfect solution. Their website also has some excellent printable posters and other resources. I am really looking forward to purchasing the new journal for tweens and teens which is due to come out in September. How many times have you thought, said, or felt this phrase? It is an expression of frustration that plagues many when learning new tasks. For many children, it can turn into a mantra. How do you help? 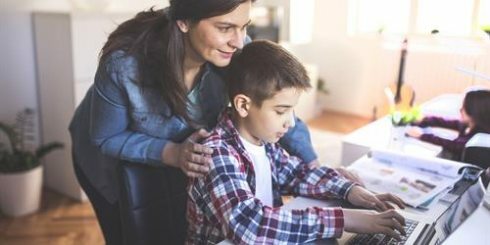 A parent’s natural reaction is to say, “Yes you can.” We know that with a little time and practice, those multiplication tables will be learned. However, children live in the present when speaking about their learning. At that moment, they are right. They do not know how to do it. Telling them that they can feels like a lie and causes arguments. How amazing is it that adding 3 little letters can change all of this? The magic letters are Y-E-T. I CAN’T DO IT, YET! How different does that feel? It lets your child know that they are in the middle of a process. Those 3 small letters allow them to have their moment of frustration and then move on. Child : I hate circles! Child: No. I hate finding the circumference of a circle. I can’t do it! Me: I remember doing that it school. It took me some time to figure it out. Child: I’m just so frustrated! Child: It’s going to take forever to learn it! Child: (rolls eyes) Ok, an hour then. Me: Why don’t you take 5 and then come back to it. After 5 minutes, he calmed, went back to it and finished. It took him 15 minutes. There was no argument. He just moved on down the road. Yet implies success. It lets children and adults know that although they feel frustrated now, it is a temporary bump on the road to success. I challenge you to add yet next time you or your children feel overwhelmed by learning a new task. You might be surprised how quickly the frustration will dissipate. Up next in our series on Growth Mindset is “Asking Growth Questions”. Growth Mindset Parenting: PART 1: Are you a Plant or a Rock? 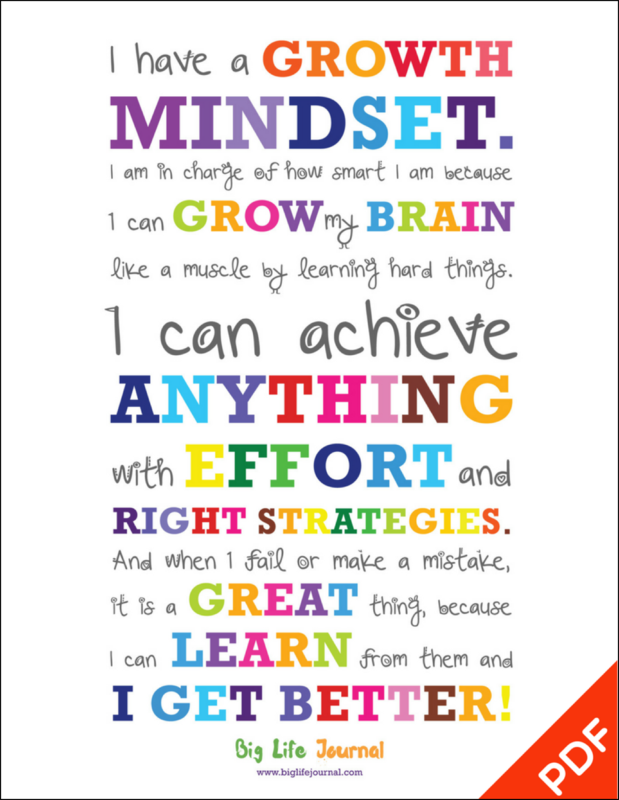 “Growth Mindset” is the new buzz term we are all hearing about. Based on the work of Carol Dweck, it explains the power behind our beliefs. When we believe that achievement is based on intelligence, talent and natural abilities that we are born with, we immediately put a ceiling on what we are able to accomplish in life. Intelligence is a rock. It’s there and can’t be moved. We have what is called a “Fixed Mindset”. In a “Growth Mindset”, achievement comes through a series of learning experiences. Talent, intelligence and natural abilities are areas that need to be nurtured for growth. 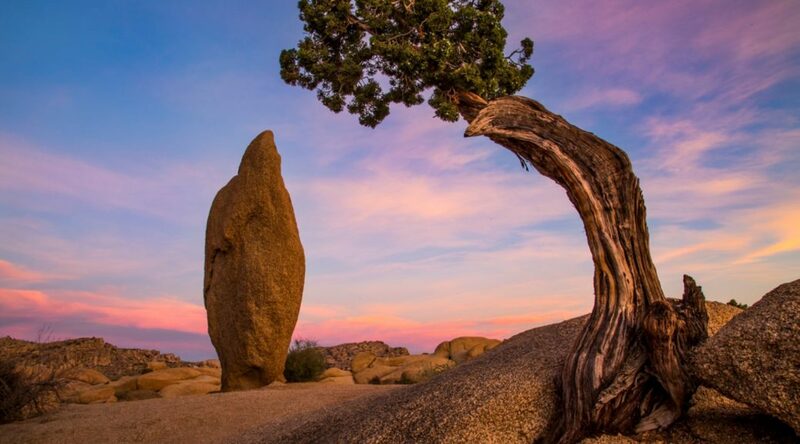 Like a plant, the more effort and resources we out in, the stronger our intelligence grows. Aria comes home from school with a sticker on her shirt. You ask her why she got the sticker. She lets you know that she read her poem in front of the class as an example of great work. When a child learns to value effort and strategy rather than being clever, they learn early on that the more they give, the more they yield. This is a skill that becomes as simple as breathing when it is properly nurtured and reinforced. 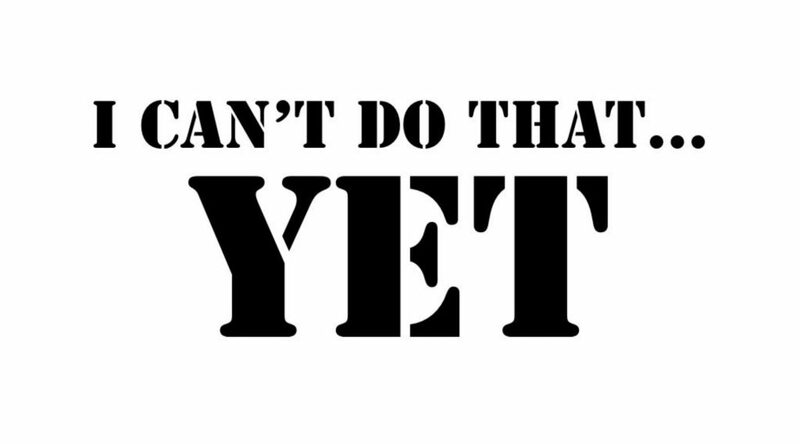 Our next article on Growth Mindset will be on The Power of Yet. Adults are deeply conditioned to notice when children have done something wrong. We think if we point out a child’s mistakes, they will learn and change. However, criticism is demotivating and children simply stop listening. Attitude and drive is what sets one person apart from another. It is not all about innate intelligence but rather curiosity, perseverance, creativity and seeking challenges. An increasing number of schools are becoming aware of this. For example, my older two children at JFS have a page in their homework diary about developing a “growth mindset”. When parents are trying to be positive, we tend to use evaluative praise. Terms like “That’s amazing”, “You’re so clever”, “Well done” or “Good girl”. This doesn’t require much effort, isn’t very genuine and doesn’t tell your child specifically what was so brilliant so they can repeat it. Children may feel you are constantly evaluating their performance. The psychologist Carol Dweck has undertaken fascinating research into how the words we use affect our children. In her study, children had a puzzle to solve. Some were praised for effort, “You must have worked really hard”, while others were praised for ability, “You must be very smart”. When those same children were given a harder puzzle, the ones labelled smart didn’t even want to attempt it. They develop a fixed mentality, the belief that intelligence is a fixed trait and you only have a certain amount. They avoid challenges so as not to risk appearing less clever. Children praised for effort develop a “growth mindset”, believing intelligence can be developed through education and hard work. These children embrace challenges, persevere and want to learn. 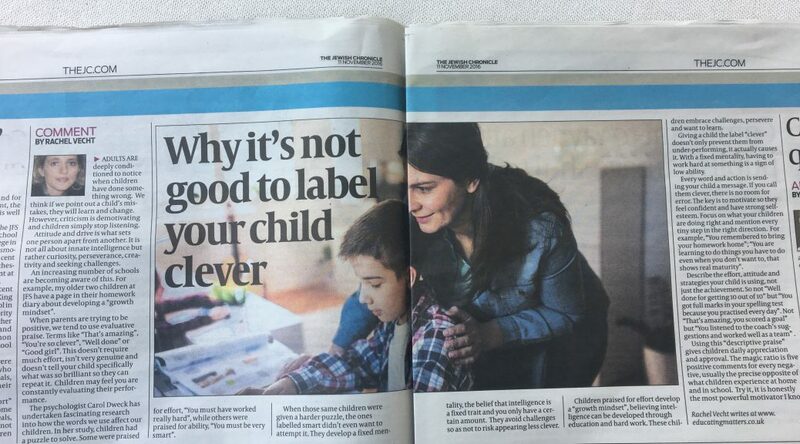 Giving a child the label “clever” doesn’t only prevent them from under-performing, it actually causes it. With a fixed mentality, having to work hard at something is a sign of low ability. Every word and action is sending your child a message. If you call them clever, there is no room for error. The key is to motivate so they feel confident and have strong self-esteem. Focus on what your children are doing right and mention every tiny step in the right direction. For example, “You remembered to bring your homework home”; “You are learning to do things you have to do even when you don’t want to, that shows real maturity”. Describe the effort, attitude and strategies your child is using, not just the achievement. So not “Well done for getting 10 out of 10” but “You got full marks in your spelling test because you practised every day”. Not “That’s amazing, you scored a goal” but “You listened to the coach’s suggestions and worked well as a team” . Using this “descriptive praise” gives children daily appreciation and approval. The magic ratio is five positive comments for every negative, usually the precise opposite of what children experience at home and in school. Try it, it is honestly the most powerful motivator I know.